Something very special came home with me from our vacation. I still love my little Kenmore, but it is currently broken and giving me all sorts of crazy tension issues. My husband is going to try to fix it for me to use as a backup machine, but in the meantime I think I'll be happy to spend some time with my new Horizon! I can already tell we're going to be great friends. I see lots of sewing in my future! awesome!!! I just read yesterday that there's a new horizon model coming out too. :) You'll love it for sure. ooh, lovely! the horizon has been on my want list for quite some time! i'm sure you'll love it!! OMG, OMG, OMG!! You lucky duck! I want to see a full review after you've thoroughly tested it out! Wow! You're so lucky, I love my Janome but my model has nothing on the Horizon. I'm with you sista!!! Love, love, love my Horizon just for the thread cutter alone! Wow, will you look at that...beautiful! I'm excited for you! Wow! Lucky you! Have fun. So nice congratulations!!! 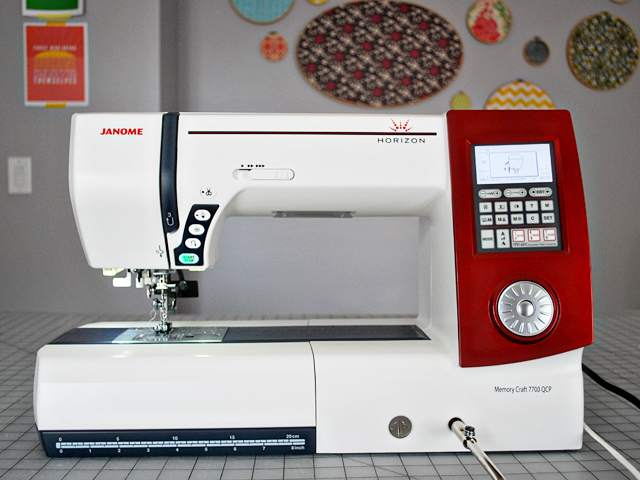 I can't wait until I can upgrade my Janome! Yay and Congrats! That's very exciting! I didn't end up getting a new machine. My old sewing machine is working again (thanks to my dad and the issue simply being a sticky clutch). Now I can spend the money on fabrics and patterns... or maybe a serger. Enjoy!!! I sure love mine!! !